KPB Land Bridge Transportation has vision to go the extra mile. Based in La Porte, TX, Land Bridge has access to the Port of Houston’s Turning Basin, Barbours Cut and Bayport terminals. 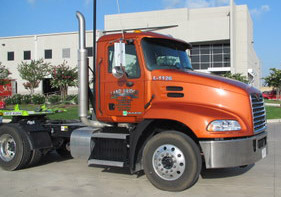 They also provide hauls within Texas, to neighboring I-10 states and Florida. Their fleet includes 45 new “green” tractors, each installed with state-of-the-art dispatch technology. Land Bridge has an assortment of equipment including light weight, 20 foot, 40 foot and tri-axle chassis. Their friendly service and can-do attitude speak volumes in this industry. KPB Land Bridge is the solution to your trucking needs. ©2011 KPB Landbridge, Inc. All rights reserved.